We'll be using a boat called Dream It Do It (Didi for short, which is mildly ironic as Helena's early childhood "familiar" was a rag doll called Diddy). Didi is one of the classic "Woodvale Class" 23ft plywood boats, sheathed in fiberglass, and was built by Roger Haines, who subsequently rowed her across the Atlantic in 93 days in 2010. Roger's craftsmanship and research into the details of how to fit her out were second to none, and we were thrilled to be able to buy such an excellent boat. She will weigh somewhere around half a metric tonne when laden (we think, though quite possible nearer 0.75 tonnes, and the 150litres of water ballast is only part of that). 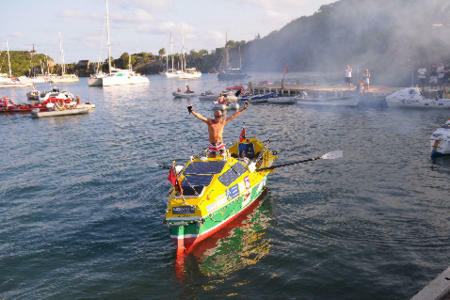 For more on Roger's epic row, and photos of Didi being built, see www.ataleof2oceans.com. Roger Haines arriving in English Harbour, Antigua in Didi. Thanks to Herald Information Systems for hosting this site.